celebrate 4705 - eat a RAT ! HAPPY NEW YEAR of the RAT !! RATS made of chocolate cake and whipped cream are eminently edible and a great way to celebrate chinese new year. 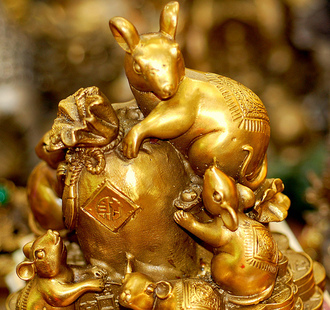 the rat in chinese astrology is considered an alert, cunning and sharp minded animal, winning him first position in the celestial zodiac race. rats do very well here in new york city, home of the urban legend 10 lb. new york city rat. a couple of years ago, these hefty rodents were filmed eating out of the trash at gracie mansion, where our mayor resides. 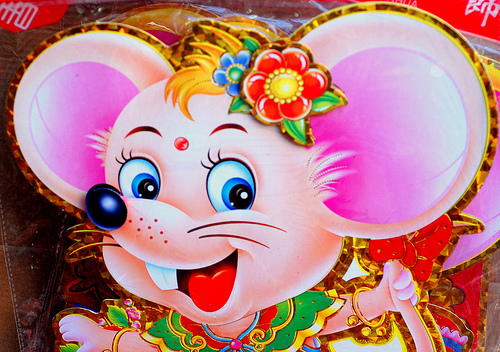 happy rat decorations are sold on the streets of chinatown. of course, chinese people prefer the cute disneyfied version of rat, who bear no resemblance to the urban, all too real hairy rat population. 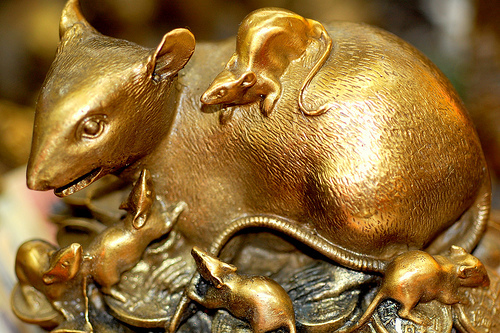 an urban myth is that there is one rat for every human in nyc. this is rex the rat. people born in the year of the rat 1948, 1960, 1972, 1984 are clever and like to be pioneers. rat people love a good challenge, whether in sports or pursuing a mate. they are loyal to friends, family members, and cherish those close to them. 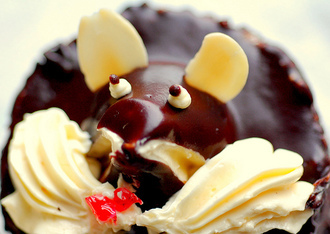 rats are best known for their charm, and have excellent taste for quality. the rat year begins a new cycle. it is a time for new beginnings and fresh starts. the state of israel was founded in a rat year, 1948. if you would like to write a new chapter in the book of your life, this is the year to do it. hedge fund rats. in china, it is said that there are few poor rats. 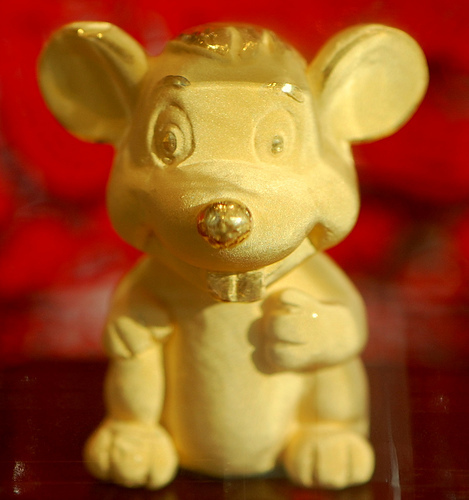 an earth rat is considered to be very auspicious. in hong kong, singapore and southeast asia, chinese feng shui masters foresee a lot of correction in the stock market this year, while industries linked to earth and metal signs are expected to flourish. another feng shui master is optimistic that the southeast asian markets will be stable after a tumultuous start, like a seed sprouting from the ground. "it's chinese new year, babies...... we're eating at TACO BELL !!" This is a second “co-blogged” post composed by food writer/photographer jo jo, of eat2love blog. Thank you, jojo! (All previous co-bloggers archived here.) If other creative types are interested to share the forum here on any other topic, please contact me for details. copyright 2008 eat2love.wordpress.com. all rights reserved. Its very attractive and great topic. As written above,as per chinese new year, rats are very sharp minded, so it is very auspicious to place the earth rat. The topic looks very interesting. "The home is where the heart is". The ancient practice of Feng Shui is all about joining the various aspects of a good and successful life into one’s environment.